Crown shaped flower design studded with sparkling cubic zirconia which are bright,magnificent, sleek and full of surprises. Selected high quality alloy materials combined with superb polishing techniques, display beautiful luster, smooth surface and is anti-allergic. 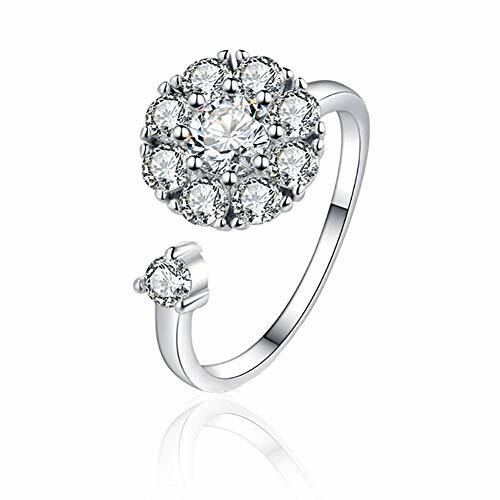 Each spinning ring has a good anti-anxiety function, it allows you to rotate the crown flower with Zirconia diamonds at will, when you feel bored or have stress, you can play with it to relieve stress or relax yourself. 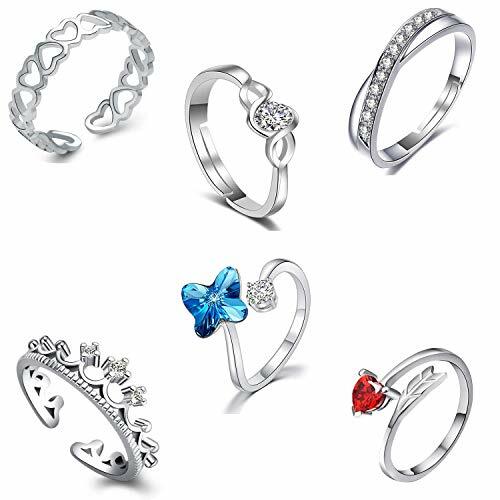 It is an interesting ring suitable for every girl and woman. ✔SKIN FRIENDLY: Alloy (97% tin and 3%bismuth). Nickel free and Lead free as per International Standards.Hypoallergenic and nickel free, safe for sensitive skins. 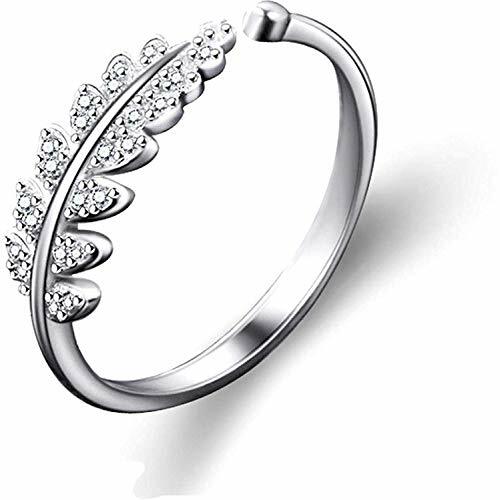 Beautiful& Elegant this finger rings for women give the jewelry a more agile meaning. Especially suitable for birthday, party, working, banquet,holiday, daily wear, vacation, ball, travel, dating, back to school,anniversary, wedding, Halloween, etc. It is especially suitable as a daily wear, and makes you charming and attractive with a dash of elegance. ✔GIFT FOR HER: Ideal Valentine,Birthday, and Anniversary gift for someone you LOVE. With our packaging Box,you do not need to opt-in for any additional gift packaging. The product comes in a beautiful Elegant Ready-to-Gift Box. 1. 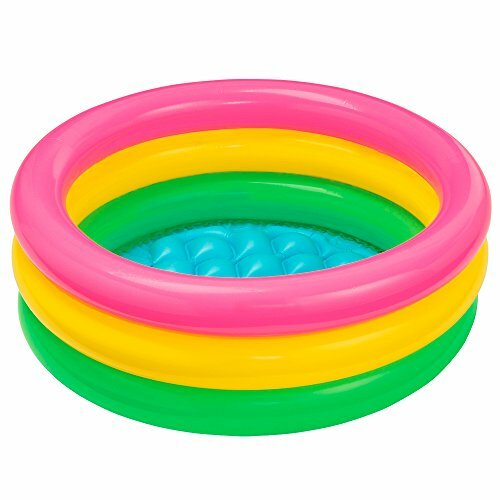 Avoid wearing the ring while doing any activities involving water . 2. Avoid direct contact with chemicals like skin care products or any alkali products. 3.Please wipe the ring with a clean dry soft cloth. 4.Store your jewelry in a clean and dry box. We are a jewellery line which provides a wide range of stylish as well as fashion accessories for both girls and women that goes well with modern and traditional outfits. The vast variety of products includes necklace set, traditional imitation fashion jewellery, pendant set, earrings, rings, bracelets and many more. We are manufactures of luxurious jewellery with high-end fashionable design which helps in enhancing your style factor that adds sparkle to the natural beauty of a women. We bring jewellery designs to you and this jewellery tries to make you look graceful and stylish. So, wear any stunning piece from our collection and become a style icon at next get-together party, ceremony, wedding and festive time. The best is assured to you as we remove all middlemen margins. You can also wear it on regular basics as well as parties also. 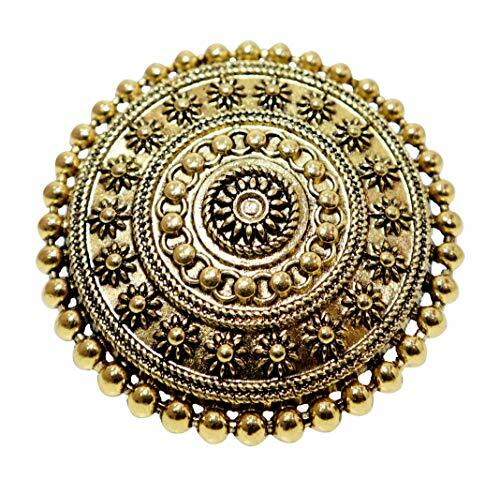 Thus, beautiful jewellery is made available at very low range. 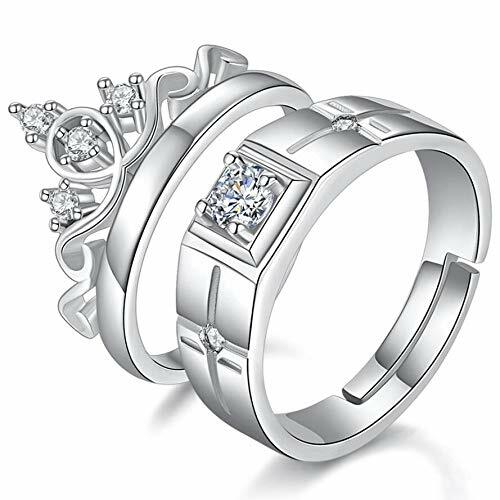 Flexible and adjustable Ideal Couple rings Material: silver plated 1 set of 2 pieces of adjustable couple rings for the king and queen. Each set includes a bigger male ring and a smaller female ring. 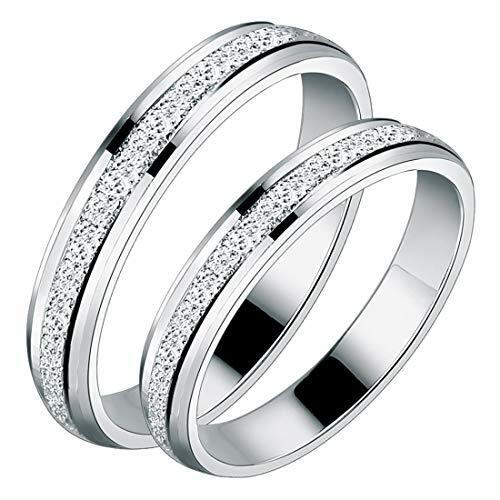 The rings are silver plated and is a beautiful reminder of your everlasting love. 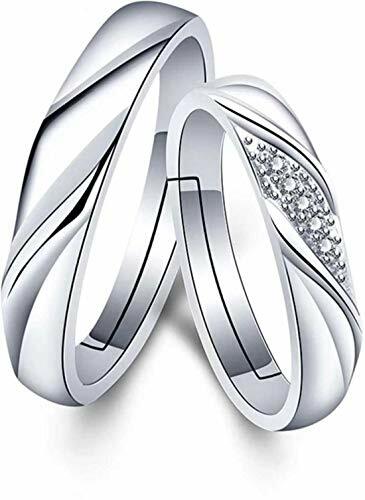 Rings can be adjusted as per size Gift for Her/him: Ideal Valentine, Birthday, Anniversary Gift For Someone You Love Great item for boyfriends or girlfriends or lovers in life, fit occasions like valentine's day, birthday, Christmas, Anniversary Gift For Someone You Love, friendship day, proposal, engagement. Yellow Chimes brings exclusive Traditional Jewellery designs to you from renowned jewellery manufacturers all over the world. The Best Price is assured to you as we remove all middlemen margins and real-estate expenses by directly purchasing from international manufacturers. Thus, beautiful and contemprary Traditional Jewellery is made available at very reasonable prices to our valuable customers. Look After Me: Store each item separately. Avoid exposure to detergents, water, lotion, nail polish removers, hairspray, perfume, bleaches, and ammonia-based products. Clean accessories by wiping them with a dry or very slightly damp microfiber cloth and then drying thoroughly. Use gentle rubbing and don't use ultrasonic cleanser. Disclaimer: Every care has been taken to ensure that the product details are correct. All dimensions are measured by hand, so there might be a very slight variation. Whilst the image is a true representation of the standard product, slight variation in colour replication may occur due to lighting/flash during photography. About Via Mazzini: Via Mazzini is a high fashion up-scale accessories brand for modern, trendy, stylish, and independent women. We carry quirky and fun-filled range of accessories, which are funky, vivid, adorable and spell attitude and individualism. Via Mazzini allows customers to outwardly express the inner visions of their bold, feminine, edgy, and sensuous self. Best choice for fashionable person like yourself, Wear yours and you're the focal point, Or get it for your loved ones to make them more appealing and attractive. 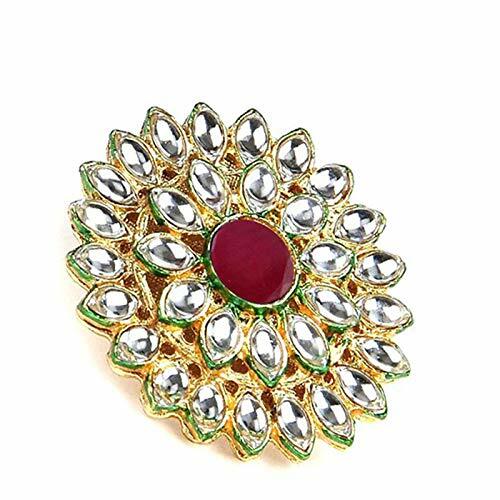 About Sansar India Jewelry Sansar India offers a wide-range of fashionable jewelry with the best quality at the best competitive prices to our customers. We keep our fingers on the pulse of emerging trends and practices and a trained eye on the newest designs and revivals of classic styles- Earrings, necklaces, bracelets, bangles, anklets, and jewelry Sets. Fashion, exquisite taste, elegant. All from here. "Jewelry Speaks for a You Long Before You Utters a Word" Get your jewelry from Sansar India as a special gift for a loved one or a beautiful piece that complements your personal style. Exquisite Craftsmanship and Top Quality Every piece is made with high quality standards and material and is manufactured with world-class craftsmanship. Top Notch Customer Services Please feel free to contact our customer services if you have any problem with the product. We will be responsible for any product problem. Just contact us and we will assist you in finding a solution promptly. PEORA brings to you this set of couple rings which works as a great gift on anniversaries. Made of stainless steel material, the rings are quite durable. The beautiful heart design symbolizes togetherness. Free of nickel and lead, the rings are skin friendly and do not cause any skin irritation. Celebrate the eternal bond of love with your soul mate by wearing this ring. Quality matters us the most. 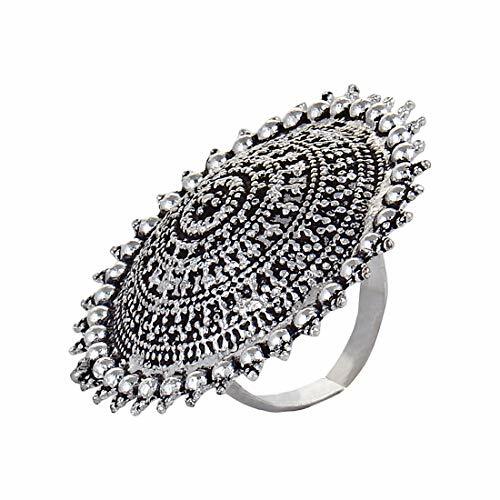 Peora rings are plated with high quality material gold and platinum, making it more alluring and shiny. Add a touch of exquisite brilliance and sophistication with this elegant valentine partywear finger ring combo. The rings symbolises infinite love of unmatched elegance and grace. Studded with immaculate CZ and crystal stones, this combo is truly a piece of art. An apt rings for daily wear. All products from Om Jewells come in a good quality jewellery box. The size of the ring is adjustable.